“PANORAMA,” an installation by Natalie Lanese, combines collage and pop patterns to set up narratives that address, oftentimes humorously, the more serious realities of American culture. “In the Mountains” is part of Natalie Lanese’s “PANORAMA” exhibit on display in the Center for the Visual Arts Gallery through Saturday, Sept. 28. Her massive scale patterns transform into a geometric landscape in which the collaged elements create conceptual spaces and confront ideas of image vs. reality, depth and depthlessness. The exhibition is on display through Saturday, Sept. 28, at the Center for the Visual Arts Gallery on the UT Toledo Museum of Art Campus. Lanese, a Toledo resident, is an assistant professor of art and gallery director at Siena Heights University in Adrian, Mich.
She recently has exhibited at Jack the Pelican Presents in Brooklyn, N.Y.; the deCordova Sculpture Park and Museum in Lincoln, Mass. ; Montserrat College of Art in Beverly, Mass. ; and the Scope International Art Fair in Basel, Switzerland. Gallery hours are Monday through Saturday from 9 a.m. to 9 p.m., and Sunday from 10 a.m. to 9 p.m.
For more information on the free, public exhibition, contact Pond at benjamin.pond@utoledo.edu or 419.530.8346. “More Eyeballs,” “Section of the Neck” and “Relax” are a few of the 11 works of art by UT students on display in “Grossology” at Imagination Station, the hands-on science center in downtown Toledo. Art by UT students is on display at Imagination Station as part of the “Grossology” exhibit, which continues through Monday, Sept. 2. Using the book Gray’s Anatomy as inspiration, students in the Lithography class taught by Arturo Rodriguez, associate professor of art, and the Anatomy class taught by Ben Pond, art lecturer and director of the Center for the Visual Arts Gallery, collaborated on a large, bound book project called Gross Anatomy. Students used lithography as the basis for their initial drawings and then embellished the pages with additional drawing media. Two copies of the large book were created, and another series of prints was made for display. One book was donated to Mulford Library on UT’s Health Science Campus, and the other was given to the Toledo Museum of Art library, where it is on view. The project was completed last fall. Works on display at Imagination Station were created by Alyssa Brown, Stacey Cruzado, Sarah Emch, David Folck, Lisa Franko, Wes Rucker, Dylan Gallagher, Katie Heft, Dingzhong Hu, Josh Klein and Shirley Mei. 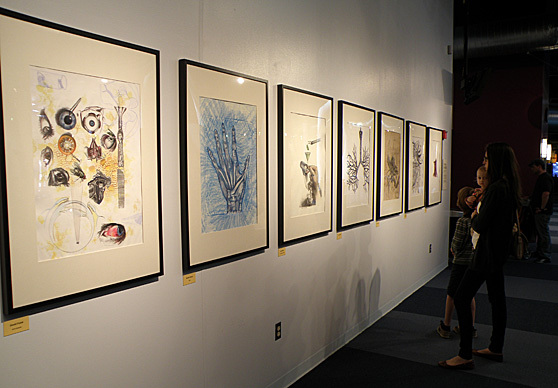 The artwork by UT students can be seen in “Grossology” through Monday, Sept. 2. For more information about admission and hours of operation, visit imaginationstationtoledo.org. The University of Toledo Department of Theatre and Film will hold auditions for its fall plays Monday and Tuesday, Aug. 26 and 27, in the Center for Performing Arts Studio Theatre. • “Fox Hunt” and “Strip Tease,” two one-act political satires from Polish playwright Slawomir Mrozek. The plays will be performed back to back in the same performance Friday through Sunday, Oct. 11-13, and Thursday through Sunday, Oct. 17-20. • “Out to Lunch,” a comedy written by Joseph Langham. This play will be performed Friday through Sunday, Nov. 15-17, and Thursday through Sunday, Nov. 21-24. Auditions are open to all. Sign-up sheets are posted outside the Theatre and Film Department office, located in Center for Performing Arts Room 1030. Audition preparation information can be found at http://utole.do/auditions. For more information, call the Department of Theatre and Film at 419.530.2202. It’s the 1980s, New York City, middle of the night. Two people can’t sleep: a writer with writer’s block and an actress with a thick foreign accent and no equity card. Successful artists Jan and Anka Krupinski fled Communist-occupied Poland for the freedom of New York, but how can they pursue their vocations in a new language and a new culture when it seems that no one wants to hear what they have to say? In Janusz Glowacki’s black comedy “Hunting Cockroaches,” a series of “visitors” in the form of nightmares, memories and worries arrive as Jan and Anka wrestle with insomnia, paranoia and a future that doesn’t look like anything they ever planned for back in Poland. “Throughout this play, the political situation in Poland is referenced, but the characters still long for their homeland because they can’t seem to find a way to fit in in the United States. 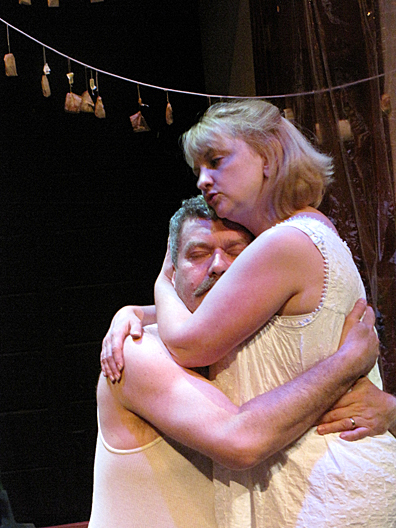 So they are caught between a rock and a hard place,” said Dr. Edmund Lingan, UT associate professor of theatre and artistic director of the Glacity Theatre Collective, who is directing the production. The cast features Cornel Gabara, UT associate professor of theatre, reprising his role as Jan for the Glacity Theatre Collective production. Jennifer Nagy Lake also returns to play Anka. Dr. Ben Pryor, UT vice provost for academic program development, and Pamela Tomassetti play the six remaining characters. James S. Hill, UT professor and chair of theatre and film, designed the set, and Holly Monsos, UT associate dean of the College of Visual and Performing Arts, designed the costumes. “Hunting Cockroaches” will open Friday, July 12, at 8 p.m. in the newly renovated Ohio Theatre, 2915 Lagrange St. in Toledo. The play will be produced in association with the Lagrange Street Polish Festival; for more information on the festival, go to polishfestival.org. The show will continue with performances Saturday, July 13, at 8 p.m. and Sunday, July 14, at 2 p.m. Doors open one half hour prior to curtain. Tickets are $16 and are available at http://glacity.tix.com and, as available, at the door. For more information, go to glacity.org. Seder Burns and Phoebe Ballard, faculty members in the UT Department of Art, won a Blackboard Catalyst Award for Exemplary Course Program, which honors the design and development of innovative classes that represent the best in technology and learning. 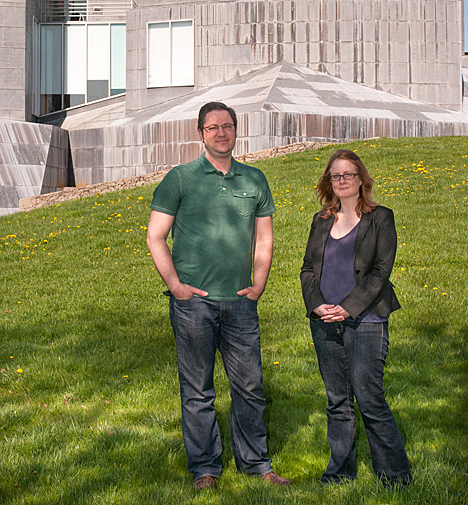 Seder Burns and Phoebe Ballard, who received a Blackboard Catalyst Award for Exemplary Course Program for their digital media class, stand outside the Center for the Visual Arts. Their online course, Fundamentals of Digital Media, also was one of 10 exemplary course winners recognized as Directors’ Choice for Courses With Distinction. Part of the annual Blackboard Catalyst Awards Program since 2000, the Exemplary Course Program Award highlights technologically rich, engaging, well-designed and pedagogically sound courses that showcase best practices for the user community. More than 160 entries were evaluated in a peer-review process by more than 300 faculty and instructional designers. Submissions were judged on course design, interaction, collaboration, assessment and learner support. The Blackboard Catalyst Awards annually recognizes innovation and excellence in the Blackboard global community of practice, where teachers and learners work every day to redefine what is possible when leveraging technology. Burns, lecturer in the Art Department, and Ballard will be honored alongside other Blackboard Catalyst Award winners during BbWorld, Blackboard’s annual user conference, in July in Las Vegas. Additionally, their course will be highlighted on the Blackboard Catalyst Award website at blackboard.com/catalyst. To learn more about UT’s online degree and certificate programs, visit utoledo.edu/dl, email UTDL@utoledo.edu or call 419.530.8835. Several concerts and master classes will be held this week as part of the Art Song Festival and Workshop at The University of Toledo’s Center for Performing Arts Recital Hall. “These concerts provide artists attending the festival with the opportunity to perform while presenting the public with world-class concerts of outstanding music not often available locally in live performance,” said Dr. Denise Ritter Bernardini, UT assistant professor of music. The Art Song Festival and Workshop is dedicated to promoting recital performances as well as to training singers and collaborative pianists in the art of recital planning and performance. This festival features master classes, voice lessons, coaching sessions and recital performances, as well as classes geared for the student and emerging professional singer and pianist. • Wednesday, June 26, at 7:30 p.m. Program: A Celebration of German, Italian and American composers: Robert Schumann, Gian Carlo Menotti, Norman Dello Joio, Steven Mark Kohn. Metropolitan Opera tenor Michael Sylvester will perform. • Thursday, June 27, at 7:30 p.m. Program: Within Spanish Borders: Diverse Treasures of Language and Song, featuring art song competition Winner Dr. Jessica Bachicha, soprano. • Friday, June 28, at 7:30 p.m. Program: An Evening of Songs by American Composers, including Aaron Copland, Richard Hunley, Samuel Barber, Celius Dougherty, Dominick Argento and Lee Hoiby. • Saturday, June 29, at 7:30 p.m. Program: Do You Know the Land Where the Citrus Trees Bloom? Works by German and Italian composers, including Franz Schubert, Robert Schumann, Hugo Wolf, Ermanno Wolf Ferrari and Reynaldo Hahn, will be featured. • Sunday, June 30, at 5 p.m. Program: Art Song Festival Concert that will showcase where all participants will perform; Dr. Michael Boyd, UT professor of music, will play piano. Master classes also will take place: Thursday, June 27, from 10 a.m. to noon; Friday, June 28, from 4:30 to 6 p.m.; Saturday, June 29, from 4:30 to 6 p.m.; and Sunday, June 30, from noon to 2 p.m.
An art song festival ticket is $60 for all concerts and master classes. Concert tickets are $10, and master class tickets are $10. Tickets are available at the door or in advance in the Music Department Office, located in the Center for Performing Arts Room 1030. For more information go to the UT Department of Music website at utoledo.edu/cvpa/music. Several University of Toledo art students recently were recognized on a national scale for bringing their art to the city. 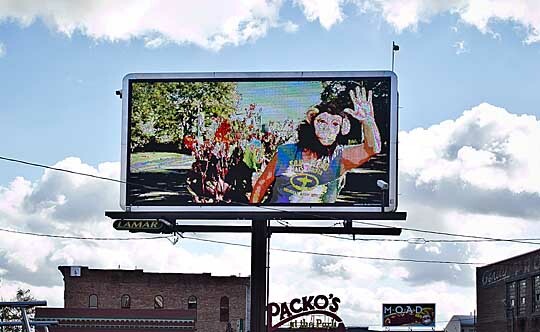 Artwork by April VanSlambrouck and other UT students was featured on digital billboards in Toledo last fall. The project, “Stories From Toledo,” developed by art students from the Time, Motion, Space class and others representing the Department of Art, was selected as the winner of the 2012 Achievement in Digital Art & Design Award by the International Digital Media and Arts Association. UT art students had their work displayed on 20 digital billboards throughout Toledo from October through December last year thanks to a collaborative effort with Lamar Outdoor Advertising. For the project, students were told to create fictional film stills that represented a larger story that was connected to the Toledo community. “This posed an interesting challenge for a time-based media class. They had to create a still image that would suggest something before and after,” Whittaker said. The student artists who participated in the project were Clinton Bales, Alyssa Brown, Kasia Gacek, Yang Gao, Morgan Hayward, Philip Herman, Thomas Johnson, Marko Milliken, Halah Mohamed, Jessica Ostrander, Jeremy Pellington, Noah Roszczipka, Austin Tuttle, April VanSlambrouck, Jon Wittes and Mark Yappueying. Click here to view the pieces used in the project. The Center for the Visual Arts building has received a $15,000 overhaul of its lighting system, illuminating not only the facility but also meeting goals of energy efficiency at The University of Toledo. “The Center for the Visual Arts is burning brighter thanks to the comprehensive fluorescent light retrofit project. Not only do we see better, but we appreciate the energy savings with the more efficient use of electricity,” said Chris Burnett, associate professor and chair of art. The center expects savings of 30 percent as a result of this project, which was completed in March. On top of these savings, the project will bring in a $11,000 rebate for the energy upgrade, and all refuse from this project was recycled, according to the project leader Sandrine Mubenga, UT manager of electrical engineering. Funding for this project would not have been possible without the help of Jim Graff, director of facilities operations, who volunteered $12,000 from his budget. The remaining $3,000 was supplied by SEED (Sustainability, Energy Efficiency and Design), UT’s sustainability initiative. The majority of the work was completed in-house by Facilities. However, some areas of the center are structured with high ceilings and called for independent contractors. Mubenga kept the University’s mission in mind and partnered with a minority business enterprise, Bryson/Tucker Electric LLC.